Want to receive updates on the trail? Click here for the Fred Meijer River Valley Rail Trail information and map. Calling all supporters of the Lowell Area Trailway! Community members who are willing to become involved with a Friends Group. We have the beginnings of a great trail system, and are at the stage where we REALLY need the involvement of caring community members to help and guide our future growth and maintenance. For further information please contact Betsy Davidson at betsy@addorio.com. 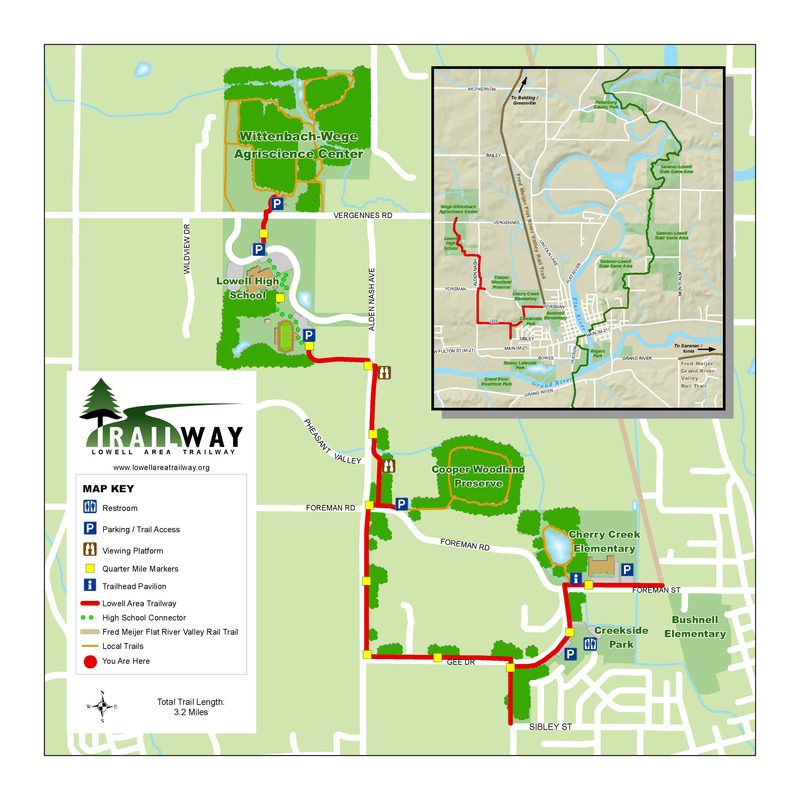 Click here for the Phase I Lowell Area Trailway Map and Walking just for the Health of it! After years of planning and fundraising, the Lowell Area Recreation Authority Phase 1 Trail project is a reality! Construction began on June 6, 2011 and completed in the fall of 2011. We are now working on signage and amenities. Beginning on Foreman Rd. 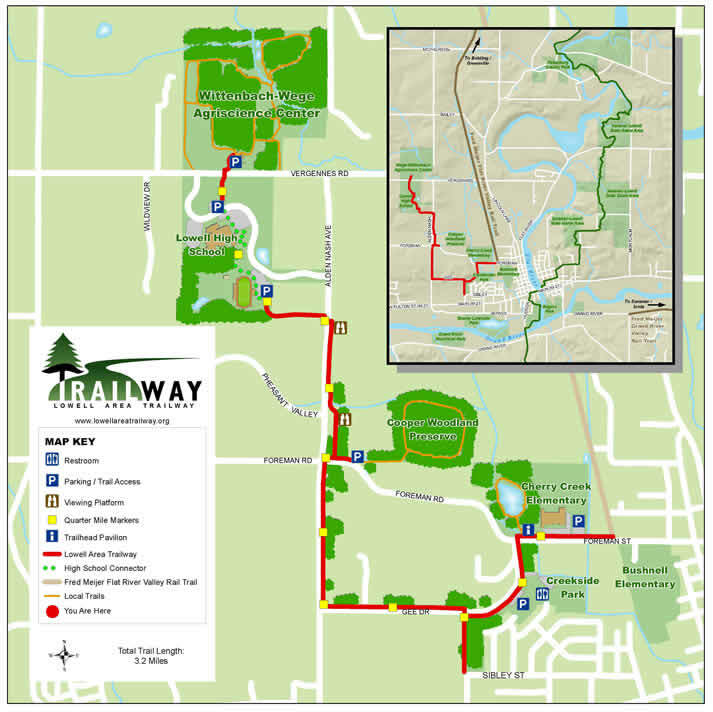 in the City of Lowell at the railroad tracks, the trail will extend over 2 miles to connect to Lowell High School and the Wege/Wittenbach Nature Center via Gee Drive, Alden Nash Road and several easements. The eight-county West Michigan region is home to more than 123,000 acres of park and recreation land. Now, the West Michigan Strategic Alliance (WMSA) is offering a database inventory of all that land for use by government leaders, businesses, residents and visitors. The inventory was completed this past summer by Susie Matteson, an intern working with WMSA's Green Infrastructure Initiative. uses for each property. Uses range from sports fields to hiking trails and water access. The West Michigan Parks and Recreation Inventory is available on the WMSA website at: www.wm-alliance.org/parks.